Happy Halloween! We don't often think of today as a romantic holiday on par with say, Valentine's Day, but don't tell the Gothic Romance comics that! 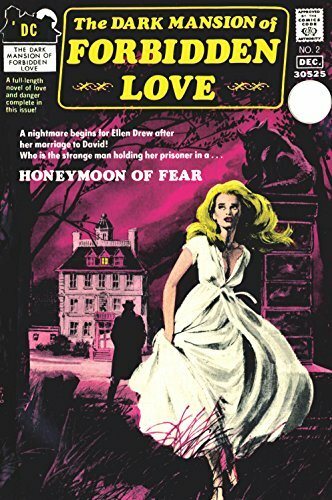 Today, I have for you a very special exposé on The Dark Mansion of Forbidden Love #2 (November/December 1971). Though the cover of my copy is nearly coming off, this issue is special to me for two reasons. Firstly, because it is one of only four issues of this series before it became the horror title, Forbidden Tales of Dark Mansion. Secondly, it is important to me because it is one of the issues that your generous donations helped me purchase last fall! So thank you for that! The first story in the issue is called, "Honeymoon of Horror" and was written by Sy Reit and Jack Oleck (via Robin Snyder and DC's records) and penciled by Tony DeZuniga. The story is broken up into three part and begins its first chapter, "Death in the Night!" with a young woman in a white nightgown cradled by a shadowy figure. Newlyweds, David and Ellen Drew, are on their honeymoon in the English countryside. After dinner at the Blue Boar Inn, Ellen insists the couple change their overnight plans and leave right away. She felt someone watching her as they ate, and she is terrified. David obliges, but first calms his new wife with a kiss. As the couple drives away from the inn, it is clear they are being followed by another car. David accelerates in fear. As in so many other comic book tales, a curve in the road comes too fast, and a crash follows. Ellen clings to her lifeless husband. Before she knows it, Ellen wakes up in a strange bed. Hovering over her are two men -- Doctor Winter, and Detective Sergeant White. They explain that she was brought back to the Blue Boar Inn after the crash and fell into a coma for a week. She slept, while her husband was buried in the churchyard. As the detective leaves, the doctor gives Ellen an injection to make her sleep. But the call of David from the grave is much too strong, and Ellen awakes and makes her way out to the churchyard. Confused and overwhelmed, she stumbles toward a man shrouded in darkness, thinking it is her beloved, David. Chapter one ends with Ellen crumpled into a fainted heap in the churchyard. When Ellen awakes in chapter two, she has no idea where she is. She is in an elegant canopy, surrounded by people she does not know. To exacerbate Ellen's confusion, everyone around her is calling her Mary. Mary Cartwright. Not only do the strangers insist that Ellen is actually named Mary, a raven-haired man named Edwin tells her he is her fiancé. A woman named Elizabeth tells Ellen that she is Edwin's sister and has been taking care of her for quite some time. Ellen is startled by the other man in the room, a doctor holding a syringe. She recognizes him as having been with the detective when she woke up at the Blue Boar Inn after the accident. But the doctor denies not only knowing her, but that there's been an accident at all. As the doctor gives Ellen an injection, he tells her that she's been in a coma for months after contracting an infection, and clearly has some sort of amnesia. But does she? Outside of the building waits a man. But not any man. Detective Sergeant White. We the audience now know for certain that something fishy is going on. Meanwhile, Edwin tries to convince Ellen to try to remember their life together, so that they can proceed with their wedding plans. Let's just say Edwin's kisses seem to be pretty darn convincing. Despite Edwin's solid romantic skills, Ellen still can't shake the feeling that something is gravely awry. She is told by Elizabeth to take her pills and stop worrying. That evening, while she sleeps, Ellen is awoken by a mystery man who calls her by her true name, Mrs. Drew. Ellen is plunged into confusion even further, and has the urge to tell Edwin. Ellen gets up to find Edwin and just as suddenly as the mystery man arrived, he runs off when the butler comes carrying a tray of food to a nearby room. Already up, Ellen attempts to satiate her curiosity of who may be behind the door. She knows it is neither Edwin nor Elizabeth. When she parts the curtains of the canopy, she is terrified at what she sees -- an elderly man calling out for his daughter, Mary... calling out... for her! She runs back to her room, shaken by the events of the evening. The next day, Edwin summons the doctor for a consult. Though the doctor tells Ellen she is well enough to go on with the wedding plans, he still gives her an injection to help her sleep that evening. Despite the mind-fogging medicine, Ellen finds herself unable to sleep yet again. This time, she is kept up by a rhythmic "Thunk, thunk" coming from the cellar. What Ellen sees takes her breath away -- a man... digging a grave! In blind terror, Ellen escapes the house (effectively joining the ranks of "women running from houses") but is quickly stopped by Edwin, who wraps her in his arms. Ellen explains to Edwin what she heard and saw. Edwin tells her that what she saw must be a hallucination induced by her illness. To prove it, he insists on visiting the cellar with her. When they arrive at the bottom of the steps, there is nothing but a few pieces of wood atop undisturbed earth. Fraught with confusion, Ellen has no choice but to believe Edwin that what she saw was indeed a figment of her imagination. In the days that followed the "grave digging" incident, Edwin kisses and caresses Ellen, more tenderly than ever. She feels safe and comforted in his arms and just when it doesn't seem like he can get any more charming, Edwin makes Ellen a proposition... marry him, marry him today! Ellen, who is feeling decidedly more like Mary Cartwright every day in her love haze, agrees. Conveniently, there is already a wedding dress prepared for her. But Ellen's happiness as soon-to-be bride Mary is short lived. She begins having doubts again after Edwin insists that her father is waiting for the ceremony to start. Ellen pleads with him that her father is dead, just as her husband David is. In a major jerk move, Edwin slaps Ellen. Incredibly, somehow, someway, Edwin is able to worm himself back into her heart, just in time to say, "I do." But there is no alter kiss, no tender looks of eternal commitment. As soon as they are pronounced man and wife, Edwin leaves Ellen's side and demands his inheritance from the old elderly man who claims to be Mary's (Ellen's) father. The old man tells him to look to the picture on the wall. Seeing nothing behind the wall, Edwin flies off the handle, and in a move that crushes my museum-trained heart, destroys the painting. He then chokes the old man, causing his death. Ellen slowly realizes that the grave was not a hallucination after all. It was intended for her, but Edwin's charm (and plank of wood) was enough to convince her otherwise. Other realizations come into fruition at this time... the old man did have a daughter named Mary who was promised a fortune as a wedding present, and, Edwin was the one at the Blue Boar Inn watching Ellen and David. In a panic over these realizations and Edwin and Elizabeth's death threats, Ellen makes a break for it. Ellen runs and runs, until she bumps into a man. Thankfully, the man is Detective Sergeant White, and he's been trying to rescue her ever since her disappearance from the inn after the accident. Detective White knew things were coming to a head when a no-good man from the village named Jackson left town wearing a fake minister's outfit. Ellen is thankful that her marriage to Edwin is as much of a sham as her identity as Mary Cartwright. Aided by his men, Detective White accosts Edwin. Much to the con man's surprise and dismay, it is revealed that the painting itself was the present. It was a Rembrandt! Oops! As Edwin is hauled away, Detective White gently takes Ellen's arm. And because at its core, this is a romance comic, he tells her that he thinks he is falling in love with her. Ellen has been given a new lease on life; one with a promising new love. Phew! Poor Ellen! At 26 pages for just the first story alone, the $0.25 original cover price seems like such a bargain! But that's not all folks -- in keeping with other romance comic books, in between the two stories is a quiz, "Do You Have Psychic Powers?" Well, take it and see! Do you?! The second story in this issue is the Don Heck illustrated, "The Mystery of Dead Man's Cove!" It is decidedly more romantic than the last, but no less spooky in its own way. Tracy Stevens is in the process of recovering from a broken engagement. She decides at the behest of friends to take a trip to Greece. Unfortunately, the trip starts off on a bad foot -- her luggage has been lost, and the weather is crummy. The only positive thing about the trip so far is the handsome man named Nikolos who was sent by the innkeeper, Mrs. Pennyworth, to fetch her. On the way to the inn, hunky Nikolos explains to Tracy how Mrs. Pennyworth's ancestors owned the whole island over two hundred years ago. They were all killed while on a fishing boat in a bad storm. He goes on to explain how the locals believe the Siren of Mysinos was responsible for their deaths. His story of legends of yore is soon forgotten, as other thoughts of Nikolos take over. The next day, Tracy wakes up refreshed and ready for the beach. After hours searching for shells on the cove, she approaches a grotto. Just as she is about to enter, she is hit in the back of the head with a rock, sending her plunging unconscious into the water. Thankfully, Nikolos saves her from drowning. After a hot and heavy rescue kiss, Nikolos tells Tracy he doesn't want her to come to cove again -- its history is much too bloody. Not only is it the site of the shipwreck, many others have perished over the years in the locale, including his uncle. That night, Nikolos takes Tracy out to dinner at the Taverna. Nikolos is approached by a rough looking man, and in private, they make plans to head to the grotto. Tracy overhears the conversation, and naturally, starts worrying. Nikolos frantically drops Tracy back off at the inn. While having tea with Ms. Pennyworth after the strange encounter at the restaurant, Tracy divulges to the old woman that Nikolos was headed to the grotto with the rough men. Mrs. Pennyworth then goes on to tell Tracy about her dearly departed husband. After a while of listening to the forlorn woman, Tracy decides she must go to the grotto herself and find out what Nikolos is up to. She sees that he is aboard a ship that is set to sail, despite the impending storm. Wasting no time, Tracy sneaks on and hides in the piled anchor rope. Nikolos quickly finds her and reprimands her for not staying with Mrs. Pennyworth at the inn. As they pass the grotto, a figure shrouded in light appears -- The Siren of Mysinos! But suddenly, it becomes clear that the siren is actually the old woman, Mrs. Pennyworth. The crew chases her into the grotto, and finally, the dark secret of the lair is revealed. Inside is the mummified body of the old woman's dearly departed husband, Charles Pennyworth! As Tracy and Nikolos leave the scene of the incident, he explains to her how after his uncle was killed he suspected Mrs. Pennyworth. In order to trap the old woman, he purposefully let Tracy overhear his plans to go to the grotto so that she would tell Mrs. Pennyworth. Clearly, the Greek hunk's explanation is sufficient for Tracy. Lastly, the issue contains a special letter/advice column titled, "Through the Keyhole of the Dark Mansion," which in part addresses the phenomena of ESP. Well, what do you think? Are the Gothic Romances for you, or do you prefer the not-so-spooky variety of love comics? I know this was a long one, so I really appreciate you sticking around to the end! Thank you so much for reading! Have a very happy and safe Halloween!